We’d love your help. Let us know what’s wrong with this preview of Household Gods by Deborah Cohen. At what point did the British develop their mania for interiors, wallpaper, furniture, and decoration? Why have the middle classes developed so passionate an attachment to the contents of their homes? This absorbing book offers surprising answers to these questions, uncovering the roots of today’s consumer society and investigating the forces that shape consumer desires. R At what point did the British develop their mania for interiors, wallpaper, furniture, and decoration? Why have the middle classes developed so passionate an attachment to the contents of their homes? This absorbing book offers surprising answers to these questions, uncovering the roots of today’s consumer society and investigating the forces that shape consumer desires. 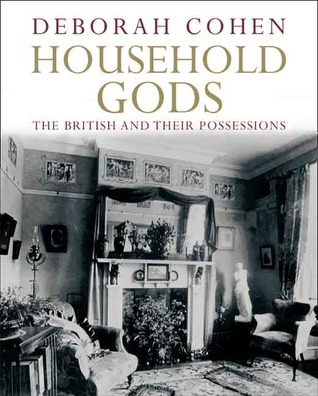 Richly illustrated, Household Gods chronicles a hundred years of British interiors, focusing on class, choice, shopping, and possessions. To ask other readers questions about Household Gods, please sign up. I read this for my Victorian England class and though I had some reservations about it was actually really fascinating. Deborah Cohen really blended the social changes of Victorian England (as well as Edwardian, post WWI and then WWII) with the changes in their material possessions and the decoration of houses. I particularly liked the emphasis on the Women's Suffrage moment and was really shocked to learn how many suffragettes (including the Pankhursts!) were involved either as owners of Furnit I read this for my Victorian England class and though I had some reservations about it was actually really fascinating. 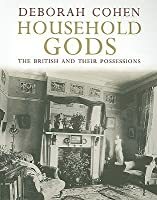 Deborah Cohen really blended the social changes of Victorian England (as well as Edwardian, post WWI and then WWII) with the changes in their material possessions and the decoration of houses. I particularly liked the emphasis on the Women's Suffrage moment and was really shocked to learn how many suffragettes (including the Pankhursts!) were involved either as owners of Furniture stores, as decorators or as writers of Home magazines. We discussed this book in class (as we do with all of the books) and it was a really engaging conversation. I know many of us expected the book to be very dry and boring but were all surprised by how engaging it was as well as how interesting of a perspective it provided. This book is utterly fascinating and I really enjoyed it. I would probably have got into it a lot more quickly had it not stunk of cigarette smoke; whoever took it out of the library last was clearly a chainsmoker. The topic, of how British social views on home furnishing have evolved during Victorian times and subsequently, proved to be really compelling. There have been a series of very significant shifts, which of course tie into broader economic, class, and geopolitical changes. To summarise This book is utterly fascinating and I really enjoyed it. I would probably have got into it a lot more quickly had it not stunk of cigarette smoke; whoever took it out of the library last was clearly a chainsmoker. The topic, of how British social views on home furnishing have evolved during Victorian times and subsequently, proved to be really compelling. There have been a series of very significant shifts, which of course tie into broader economic, class, and geopolitical changes. To summarise, at the beginning of the Victorian age, possessions carried important religious and moral connotations and restrained taste equated to good character. Moreover, furnishing the home was considered largely a man’s role. However the latter half of the nineteenth century involved an almost total reversal of this; possessions became emblematic of personality and individuality, rather than moral worth, and decorating was seen as effeminate and womanly. A boom in manufacturing allowed for a huge diversity of new furniture and fabric designs, to which customers responded enthusiastically. The early twentieth century saw the suffering and upheaval of two world wars, as well as a huge boom in home ownership, and the population turned away from eccentric individualism and towards conservative and functional styles. Modernist design failed to catch on, and to be honest still hasn’t really. The end of the twentieth century and start of the twenty-first exhibit an emphasis on housing as an investment asset. The judgemental air of property programs on TV have created a cult of magnolia walls and boring sofas, based on a self-consciousness about one’s furnishings. I am obviously over-simplifying vastly here, but those were the main points I took from the book, which supported them with a wealth of sources and intriguing illustrations. Deborah Cohen’s book is a fascinating study on a number of levels. From its starting point as a history of the domestic interior of middle class homes from the Victorian era into the early twentieth century, it serves as a lens for examining the history of the period on a number of different levels. What emerges is an entertaining account of the democratization of taste that accompanied the growth of consumerism in the nineteenth century, one that reflected and presaged broader changes taking pl Deborah Cohen’s book is a fascinating study on a number of levels. From its starting point as a history of the domestic interior of middle class homes from the Victorian era into the early twentieth century, it serves as a lens for examining the history of the period on a number of different levels. What emerges is an entertaining account of the democratization of taste that accompanied the growth of consumerism in the nineteenth century, one that reflected and presaged broader changes taking place in British society. Cohen starts with a quote from a modern-day reverend bemoaning Britain’s current obsession with do-it-yourself stores which she sets up as an ironic counterpoint to the past, as in many ways the modern obsession with home decoration can be traced to the Evangelical movement of the nineteenth century. Prior to then, taste was the domain of the upper classes, inherent and exclusive to them. As the middle class prospered, however, its Evangelical members wrestled with the impact of the growing consumerism upon their souls. Their ingenious solution was not to reject materialism but to embrace it by stressing the moral impact goods made, and to channel consumption towards embodying godly virtues. Though the impact of Evangelism faded as the century wore on, the passion for decoration only grew. The middle class increasingly sought to define themselves by their household possessions, taking advantage of both their increasing wealth and the diminishing cost of household goods. Cohen charts the many trends that emerged from this, such as the development of home-furnishing stores (many of which gradually divested themselves from their additional earlier role as undertakers), the growing embrace of the “artistic” as an ability for self-expression, and the gradual shift in the responsibility for decorating the home from men to women. She also describes the reaction from the traditional class of wealthier consumers, who began collecting older furniture, creating a market for “antiques” that allowed them to maintain class distinctions and distinguish themselves from the broader consuming public. I really did not know there was such deep psychology attached to home decoration, especially in Britain, but now I know! A book for the specialist. Cohen documents the changing tastes in furnishing of Victorian English homes, and contrasts these changes with an occasional foray into the modern era. She then ties these images of the home with societal trends and predilections. The latter is less persuasive at times, but she's done her research and you certainly get a good picture of what Victorian homes looked like. Cohen tries to pack way too much into 200 pages- would have preferred an in depth analysis of a particular city, family, or department store. Frustrating because the characters she keeps introducing and the photographs and old ads are great but the writing and structure of the book didn't engage me.